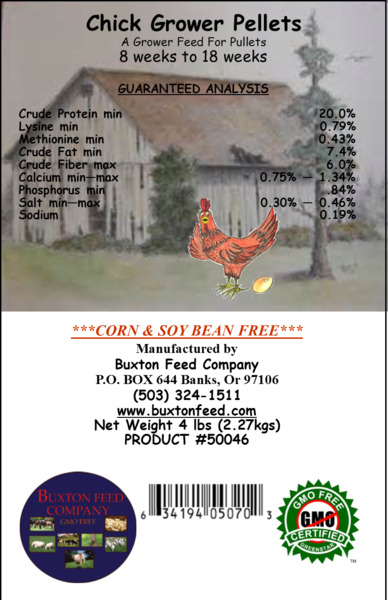 BFC Buxton Feed Company) 20% Grower pellets ensure your chicken eats the entire contents of the feed. If feed is spilled, the grower pellets are easy to find while your chickens are scratching, so less feed is wasted saving you money. Another huge benefit is the micro ingredients needed for your poultry are locked into the pellet, so they do not miss any of the good things they need. Mash or whole grain feeds leads to more waste. Your chickens knock it out of the feeder, it gets lost in the dirt. Chickens can sort out the tasty ingredients and leave important nutrients behind. Product will ship in two business days, priority mail.